On August 12, 1883, the astronomer José Bonilla reported that he saw more than 300 dark, unidentified objects crossing before the sun while observing sunspot activity at Zacatecas Observatory in Mexico. He was able to take several photographs, exposing wet plates at 1/100 second. 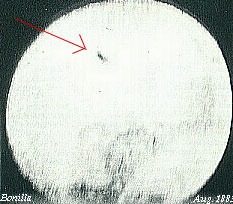 Although it was subsequently determined that the objects were actually high flying geese, Bonilla is usually given the distinction of having taken the earliest photo of an unidentified flying object, with some ufological literature interpreting the objects as either alien spacecraft or an unsolved mystery. Early on, they counted 283 of the `craft' in two hours, but, due to the bulky photographic plates' awkward set-ups and removals, they must have seen less than the true total passing the face of the Sun during their vigil. In total they counted 447 disks crossing the Sun. Bonilla said some craft showed as almost perfectly circular shadows when seen silhouetted against the Sun, that they [often] traveled side by side in pairs, and [often] in groups of up to 20, and that they moved across the Sun's face in a perfectly straight line, from West to East - ie. from right to left.